Saturday February 10th saw fringe fly and fondue served at the second annual Skijordue presented by Skijor Canada & The Alberta Skijor Society. 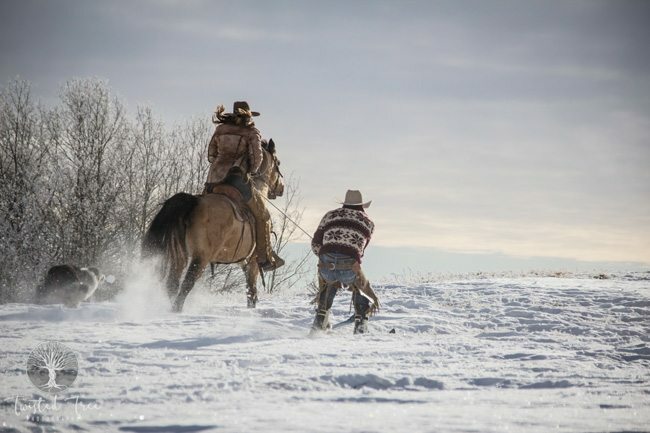 Billed as “THE social event of the Alberta Foothills” Skijordue brought “a blistering blend of snow, speed, cheese, gritty cowboys, gnarly freeriders, fur- fringe & fashionistas” to the Calgary Polo Club. 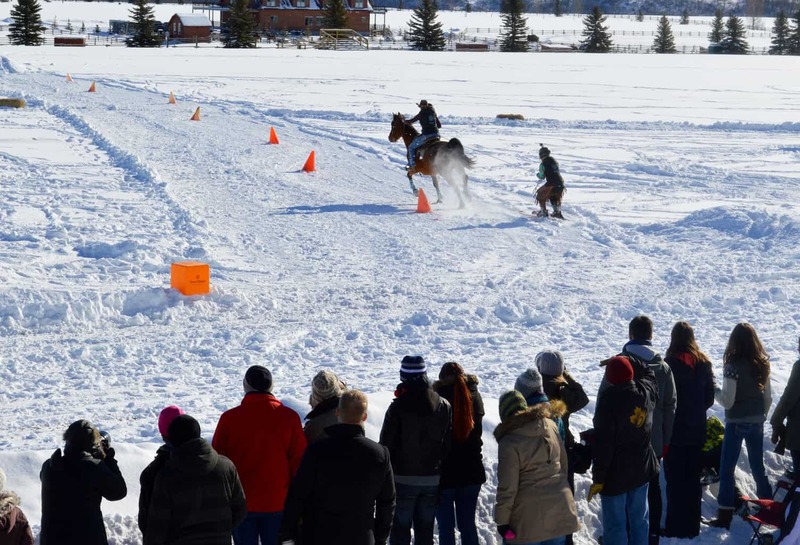 Over 150 teams competed for $10,000, prizes and bragging rights over four events. 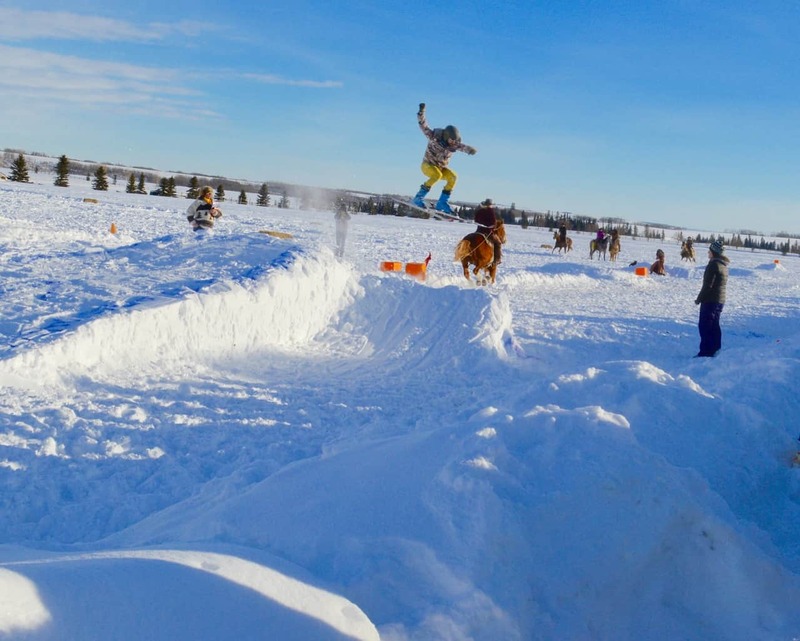 The event included exhibition trick riders and snow stunts as well as a patio for spectators to enjoy the festivities along with signature cocktails, craft beers and excellent food, including fondue and bbq. 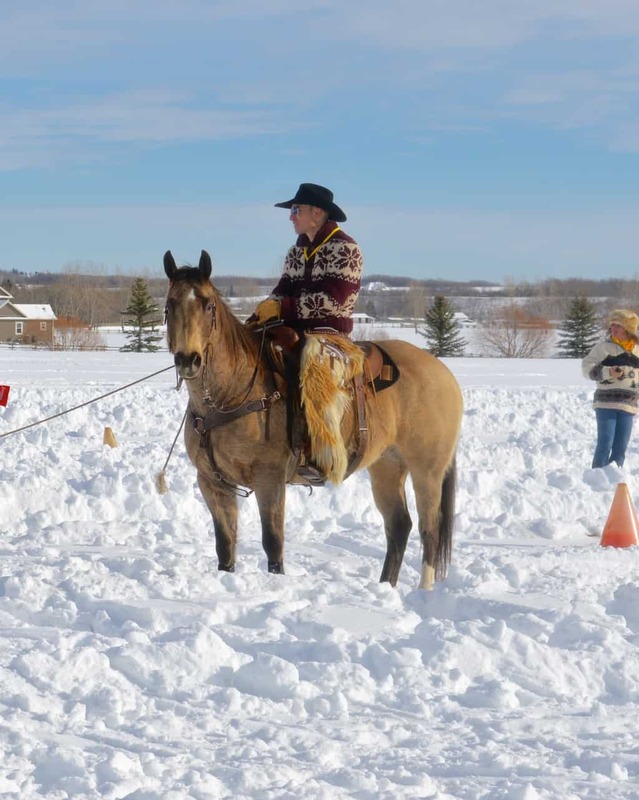 The event had a charitable twist as well, with portions of proceeds going to support the Prairie Sky Equine Assisted Therapy Association which is a local organization that provides a safe and fun environment for people with physical, mental and emotional disabilities to participate in riding lessons and Equine Assisted Therapy. Rider, Brigitte Meyer and slider, Whitney Hughes, take off down the circuit course. A Canadiana-themed team head towards the Circuit finish line. 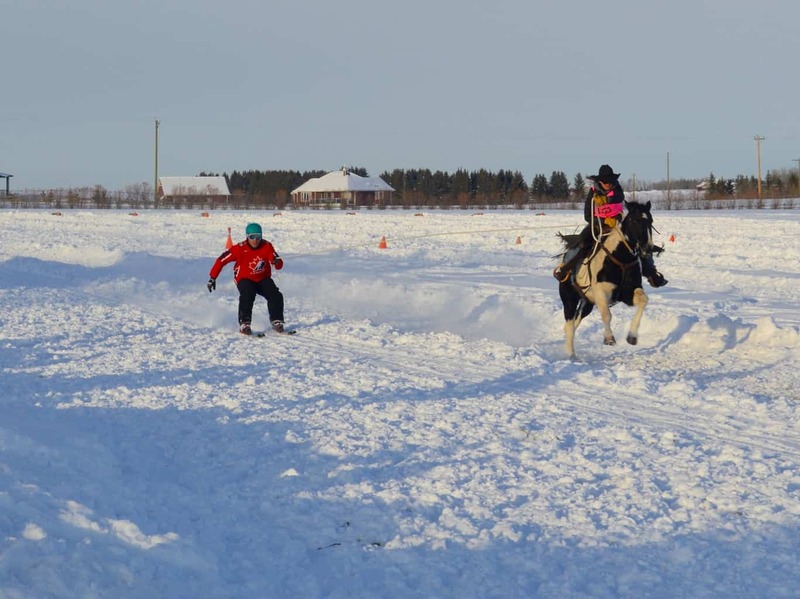 Skijordue hosts four events: the Circuit, the Relay, the Sprint and the Long Jump, where riders, and their sliders, take on a variety of obstacles in fun and fearless spirit. The Circuit saw teams leave from the start line and had sliders weave through pylons and then head up onto berms where they had to tackle pylons again. From there the team’s came down, weaved a set of hay bales, and then took a large turn before heading home. Sliders then had to complete a set of small jumps before crossing the finish line. 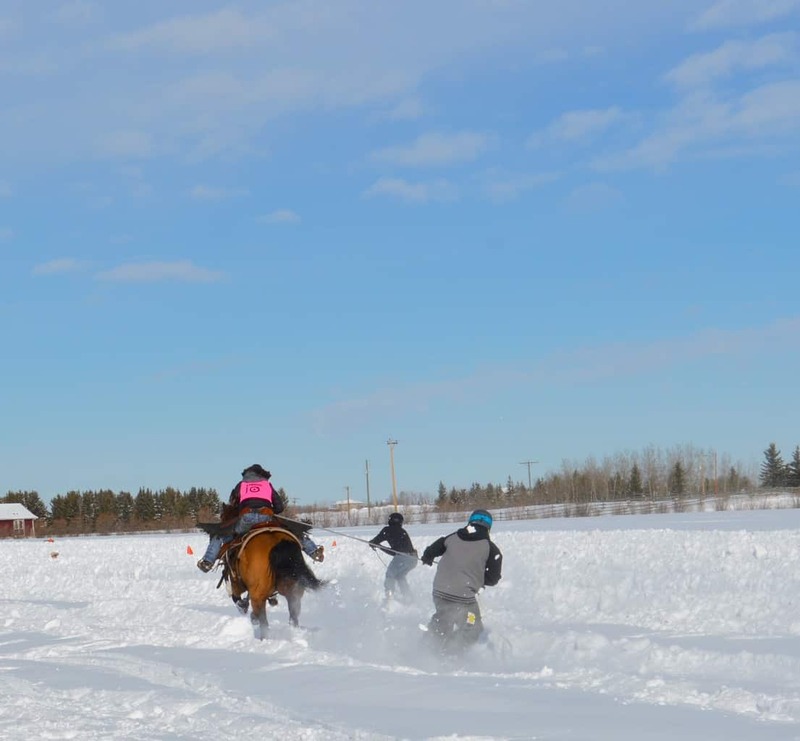 Western Horse Review team, Chelsea Brown and Pete Bernier head towards the finish line of the relay race. 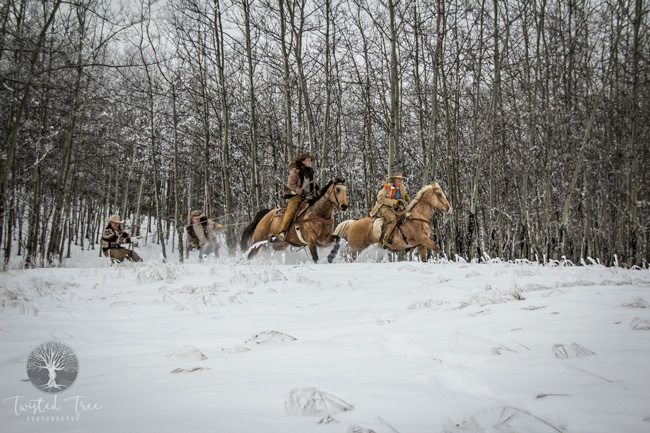 The second event of the day was the Relay race, where riders take off with one slider, run to the end of the course and then have to expertly switch to a second slider and head back. 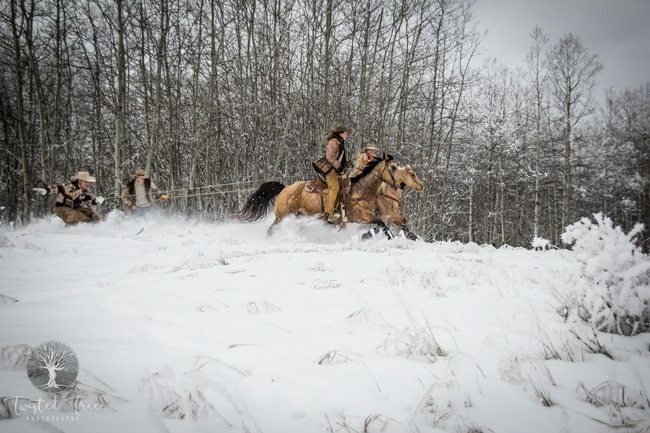 Pictured above is Western Horse Review team, Chelsea Brown running full out with snowboarder, Pete Bernier behind her. The Sprint was a crowd favourite with riders running at dead gallops from one end of the polo field to another. The Sprint was another exhilarating event where riders took off as fast as they could from one end of the field to the next. Sliders mostly maintained a crouched and controlled position in an attempt to stay up, and we are confident, were happy for their eye protection and face masks. 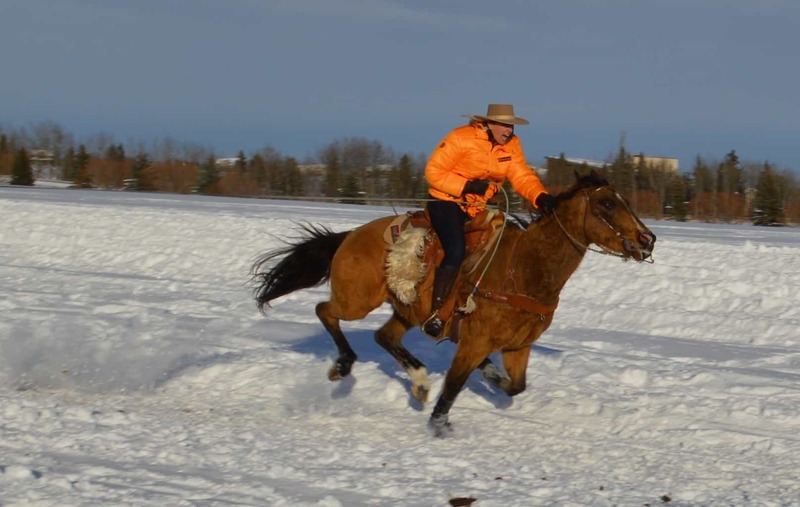 Chelsea Brown again representing team Western Horse Review with Sheldon Kennedy on the sliding side. 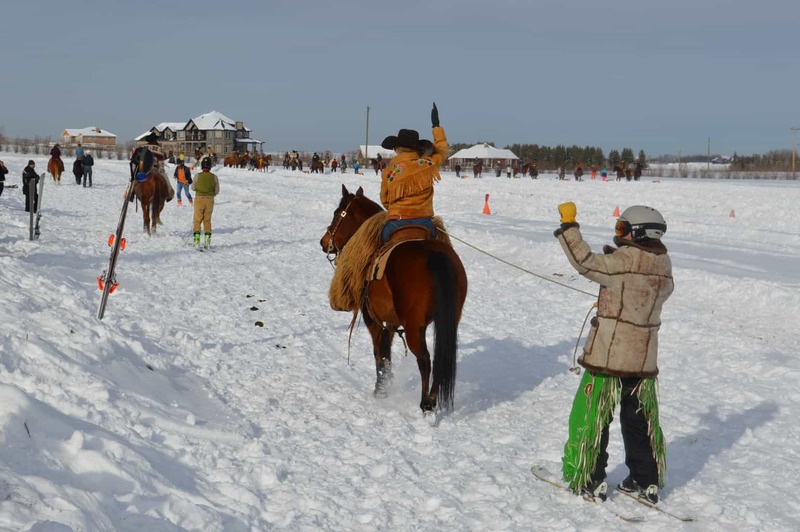 Skijordue brings together an eclectic group of sport enthusiasts, team Western Horse Review was thankful that former professional NHL hockey player, Sheldon Kennedy, could sub in for us at last minute. Kennedy expertly handled the long jump portion, and final event, of the day. The jump was 2 m in height with a sloped landing, and sliders had to exhibit control throughout the event. The long jump distance was determined by the heel of the back boot landing. Although team WHR didn’t come away with top honours, we felt that our teams did us exceptionally proud throughout the day! Slider, Devon Dinsdale grabs some air behind rider, Alex Callaghan, during the Long Jump portion of the day. Skijordue also celebrates that winter fashion can be both fun and functional. 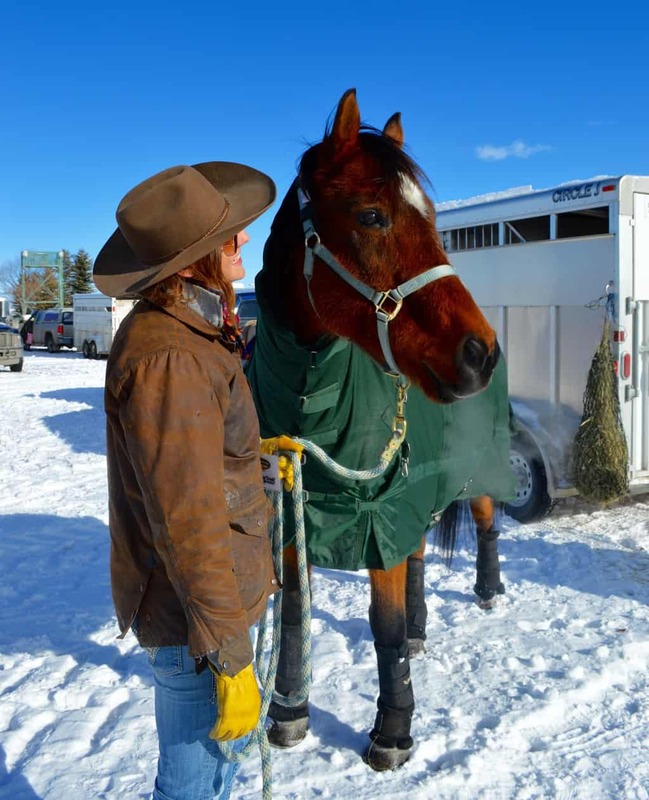 Spectators and competitors alike were asked to bring the best versions of Euro-Trash, Wild West and Novel and Innovative fashions to the Polo Club for a chance at three gift cards from Cody & Sioux. The attendees did not disappoint, and everyone managed to bring their A-game, whether that be fur, fringe, neon or all of the above! 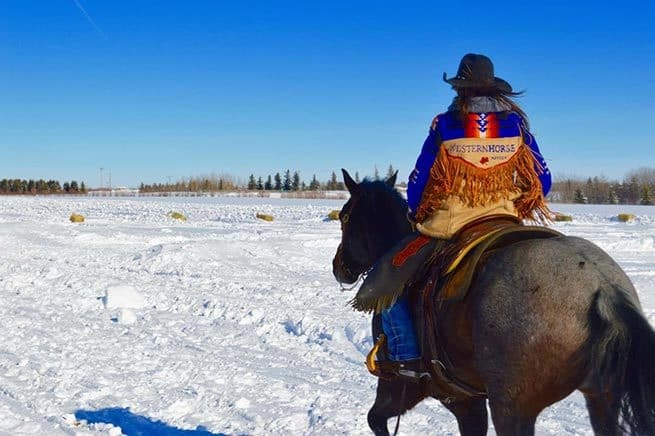 Some went the authentic route, here we see beautiful beadwork, fringe, and the iconic pattern of the Hudsons Bay Company. 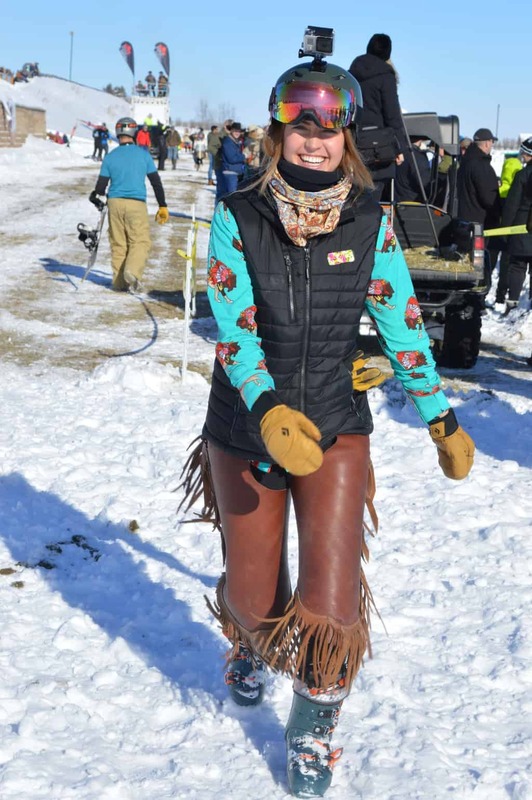 Slider, Whitney Hughes, rocks the Rodeo Q Ariat Collection, available at Lammles, Chaps and a Go-Pro heading into her first event. 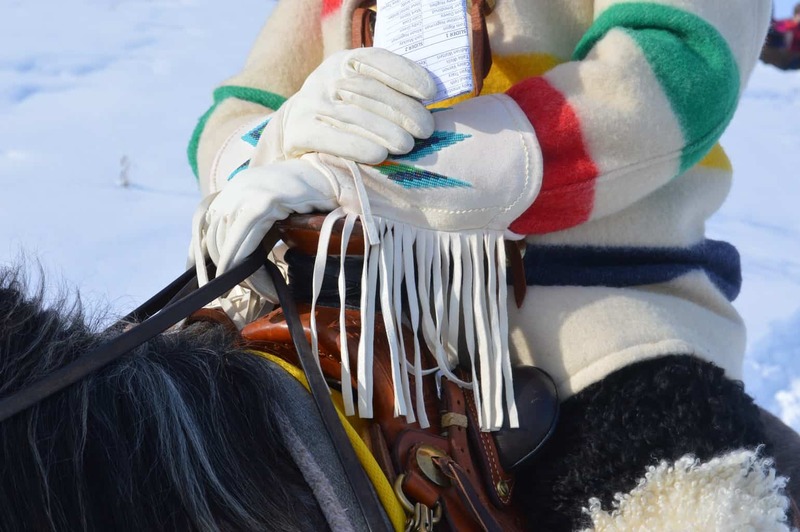 Seems to us you can rock anything astride a gorgeous horse like this! Horses showed off their fashion as well, here is a competitor horse, Mac, decked out in Back On Track products. 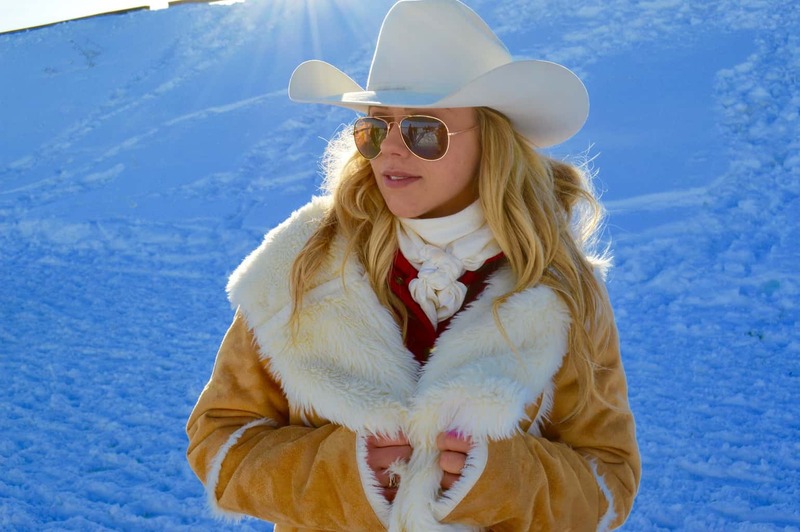 Former Calgary Stampede Princess, Lizzie Ryman, rocking the shearling Powder River Outfitters Jacket from Rodeo Dawg. Skijordue organizer extraordinaire, Sam Mitchell, takes off toward the Long Jump in a Veuve Clicquot branded down jacket. 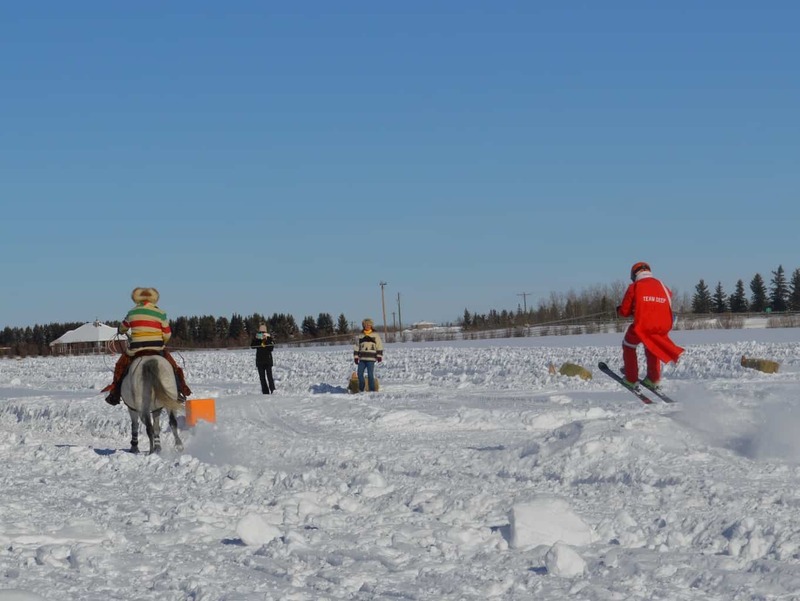 Skijordue2 was yet again a successful day that celebrated winter sport, fearless competitors and fun fashion.